PANACHE will keep you looking your VERY BEST..
Come and see what PANACHE can do for you. Changing the way you look is easy by taking home what you learn from Panache Make-up artists. 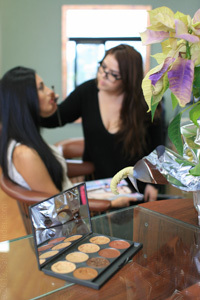 Our Make-up Artist use and recommend True Cosmetics and all new mineral make-up line with Idebenone. Available in Bakersfield only at Panache A Mark Lamas. Our Bridal Make-up Package includes Bride's application includes a practice application and application for your special day. Don't forget your Bridal party!! If you need to cancel an appointment, we appreciate at least 24 hours notice.